Christian religious leaders have been criticizing Fox News host Glenn Beck for his controversial remarks that churches that promote social and economic justice are somehow dangerous. 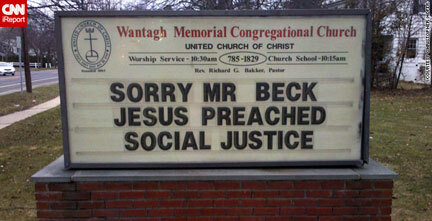 “If you have a priest that is pushing social justice, go find another parish,” said Beck. Progressive Christian group Sojourners has even launched a campaigncalling on Christians to speak out against Beck. I feel it was an unwarranted attack on Christians, and I felt like something needed to be said. The pastor said that a priest in the area who liked the sign originally submitted it to CNN. He added that so far, he has received only positive responses to the church’s message.